Ice Load Damage on Trees | John B Ward Co.
Last February was one of the most severe tree damaging weather events we can remember. A wet snow clung to the tree limbs. The existing snow absorbed the overnight rain like a sponge. And then, temperatures dropped. A freezing rain built up on the tips of the branches. You could hear the cracking of the ice loaded limbs echoing through the valleys from Gulf Mills to Media. Limbs failing on electrical and communication lines knocking out power and cable for days, and in some communities, weeks. Whole trees uprooted blocking roads and driveways. Trees on houses. It was dangerous to be on the roads. We all did our best to clear blocked driveways for emergency access. Many trees in their prime were damaged and removed, but none more affected than our Eastern White Pine. White Pine branches choked our chippers for months, while Spruce and Fir trees sustained light, if any, damage. The Pine limbs extend so widely, their limb wood so weak, that when grown in the open under an ice load they snap a few feet from the trunk leaving a stub. One limb will fall on another, and then another triggering a domino effect and stripping the tree. The compact form of Spruce and Fir trees enable the trees to shed the snow. 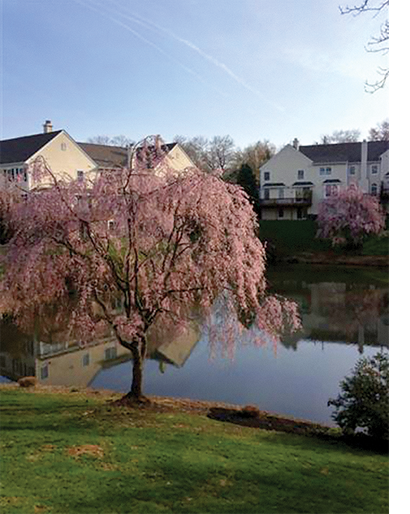 Malvern - This weeping cherry in Malvern was pruned to remove dead wood and also thinned and shaped in a natural manner. There was no snow or ice damage. Leyland Cypress toppled, their stringy weak roots not able to support the weight. Multi-stemmed Eastern Arborvitae splayed on the ground. We hoped that they would spring back. In many situations we did our best to straighten and stake. Single-trunked West Coast Arborvitae, like “Green Giant,” fared better. Like single trunked Spruce and Fir, they are able to shed the snow. We found that White Birch can bend under the weight and then rebound after. Not so with River Birch, they just snap! Brittle Grandiflora Magnolia with its evergreen glossy leaves is a snapper. However, Magnolias respond by sprouting, so all is not lost. 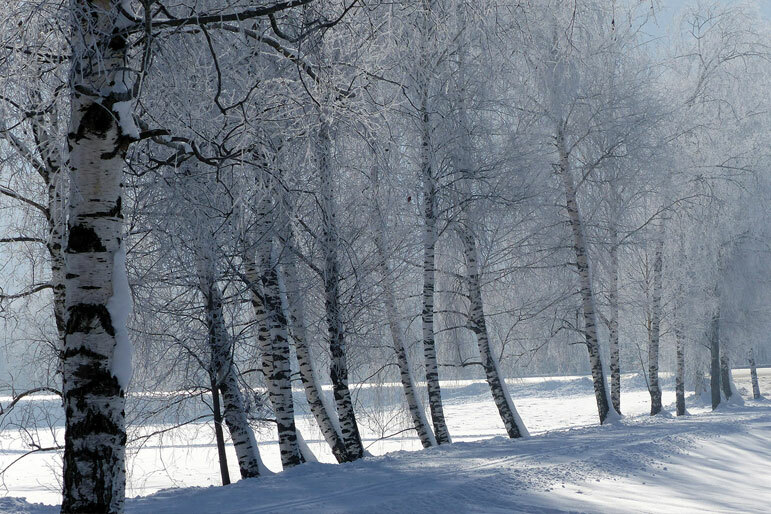 In general, trees that are susceptible to ice load damage do better when pruned and reduced. 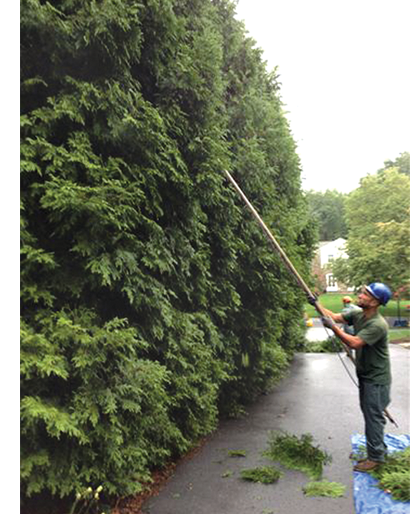 Rosemont - The sides and tops of this arborvitae hedge are reduced in a natural manner. This pruning will also help the hedge withstand snow and ice loads in the winter. Extended limbs with weight at the tips are most prone to breakage. It makes sense to reduce the extended limbs and maintain a more compact pyramidal shape. Even White Pines perform much better when reduced. We know that maintenance pruning to keep trees and shrubs in shape, and in scale with the landscape, reduces ice load damage significantly. Some trees growing well and in their prime can split apart at tight junctions with included bark. A well placed cable can prevent the loss. “An ounce of prevention is worth a pound of cure.” Your well trained Arborist can identify potential problems and propose preventive maintenance pruning.